A Smithsonian scientist found that pygmy sloths wander inland in addition to inhabiting the mangrove fringes of their island refuge. He realized that the population size of the pygmy sloth was underestimated; a new, higher estimate for the number of sloths on Panama’s Escudo de Veraguas Island points to how little is known about the species, and it underscores the need to conserve the sloths’ isolated home. Found only on a tiny island in the southern Caribbean, the threatened population of the pygmy three-toed sloth (Bradypus pygmaeus) does not have much room to grow. Fortunately, the world’s smallest sloth species is less fussy about habitat than initially thought. Once believed to live only in the mangroves that edge Panama’s Escudo de Veraguas Island, a new paper in the Journal of Mammalogy shows that the sloths also inhabit the island’s forested interior. This suggests that an estimate of fewer than 500 individuals based on the most recent census of pygmy sloths—79 individuals counted in the mangroves—may have fallen considerably short. Bryson Voirin, a former fellow at the Smithsonian Tropical Research Institute, placed radio collars on 10 sloths in mangroves and tracked their unhurried movements at three- to six-month intervals over a period of three years. Only three sloths remained entirely within the mangroves. Five moved past the mangrove edge into other tree species, and four moved more than 200 meters inland—quite far for a sloth. Coupled with population density estimates and extrapolated across the island’s 430 hectares, Voirin reached a high-end estimate of almost 3,200 individuals. Voirin warned against too much optimism for the pygmy sloth’s critically endangered status. Escudo de Veraguas is only nominally protected and developers have the island in their crosshairs—one proposal calls for turning the place into a semi-autonomous tax haven boasting a marina, airstrip, casino and hotel. 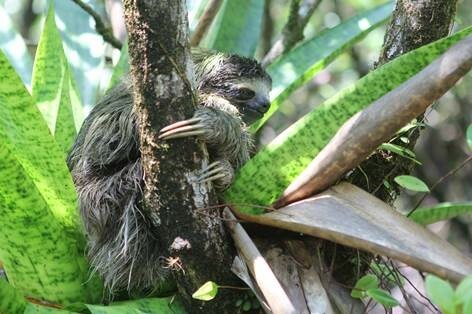 “Declaring the island a wildlife refuge or national park would protect not only the pygmy sloths, but also the other unique species found on the island,” said Voirin. Escudo de Veraguas is also home to an endemic hummingbird species and an endemic bat species. Its beaches are important for nesting sea turtles, and its flora remains understudied. Currently, the island falls under jurisdiction of the indigenous territory of Ngäbe-Buglé Comarca, and it is also threatened by unregulated timber harvesting.